Every year, World Poetry Day is celebrated on March 21. The United Nations Educational, Scientific and Cultural Organisation (UNESCO) states that "World Poetry Day celebrates one of humanity’s most treasured forms of cultural and linguistic expression and identity. Practiced throughout history – in every culture and on every continent – poetry speaks to our common humanity and our shared values, transforming the simplest of poems into a powerful catalyst for dialogue and peace." The important aspect in the description of World Poetry Day by UNESCO is equating and attaching poetry with world peace. Poems are a shared treasure that speak to humanity and has the power to move mankind. If music is the universal language, poetry is the music of soul. 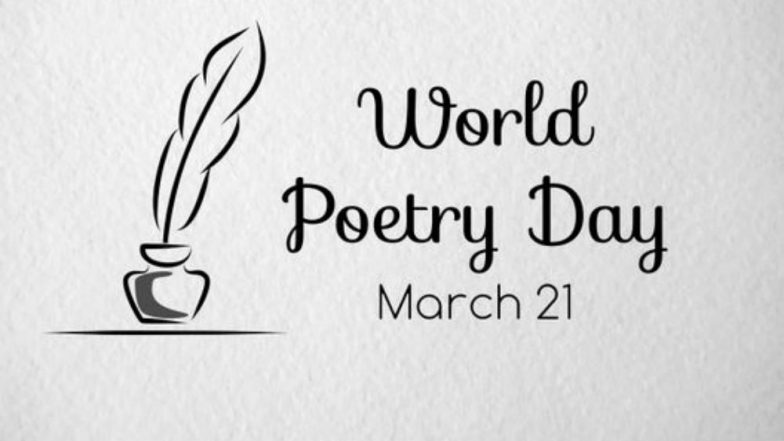 According to the UNESCO description, 21 March was adopted as World Poetry Day during the 30th General Conference of the Organisation in Paris in 1999, with the "aim of supporting linguistic diversity through poetic expression and increasing the opportunity for endangered languages to be heard." It also says that "World Poetry Day is the occasion to honour poets, revive oral traditions of poetry recitals, promote the reading, writing and teaching of poetry, foster the convergence between poetry and other arts such as theatre, dance, music and painting, and raise the visibility of poetry in the media." Indeed, when poetry is mixed with others art forms such as music and theater, its potency goes up tremendously.